STG 4. 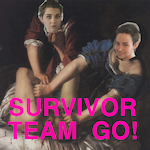 Patrick Stewart | Survivor Team Go! Cosby found guilty on all counts of aggravated sexual assault in retrial! Go Andrea Constand! The Golden State Killer found and caught at last! Go Michelle McNamara! And the police who got him I guess? Our eviction continues. Our landlord has progressed to quasi-stalking behaviors now. His father beat his mother all through his childhood and he’s been an activist campaigning against domestic violence for a million years! Patrick Stewart! Captain Picard! Sir Patrick! It doesn’t take two to make a fight! Violence is an unacceptable way to deal with conflict! Mrs Dixon, the only person who ever stood up to his father! Look up Refuge, the UK-based domestic violence charity Patrick Stewart supports! Listen to Oliver ramble disjointedly and utterly fail to do a Patrick Stewart impression!